Kerala is a breathtakingly alluring place which is blessed with calm surroundings and the forests paint a picture of lush greenery in whichever district you place your feet on. But there are some unique places which simply are the best among the lot! Presenting to you the travel destination, 'Alappuzha' or would you like to call it 'Alleppey?' It proudly presents itself as the most spick and span city of India. It is also known as the "Venetian Capital" of Kerala because of its neverending backwaters, brilliant blue lagoons, several canals and mindblowing beaches. It can aptly be called the "the Venice of the East". When it comes to houseboats, you can pick your favourite among either the stationary or cruise ones in and around Alleppey. How would you travel there? It is 53 km away from Kochi and the closest airport which you would find is the Cochin International Airport. But transportation is not a hassle because you can always depend on public transport. In this article, we shall focus on the religious places in Alleppey which are remarkable in their own way. These places should be there in your travel plans if you are intending to visit Alleppey. This is one of the most remarkable places to sing praises of in Alleppey. It gained importance from 835 AD and became famous for its events, educational colleges and Friday Liturgy. Joining your hands in prayer in this place is considered most fruitful. The church is simply awesome in many ways. One of them is that it sheds light upon the mannerisms of the Christians and shelters around 2500 families. 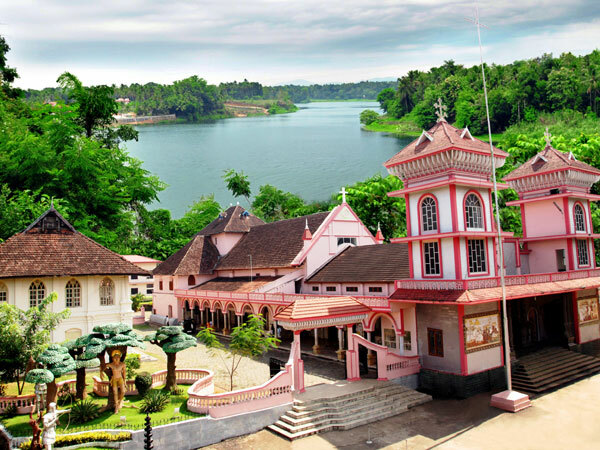 It stands to be one of the largest churches and parishes of the Archeparchy of Changanassery. The church being a tribute to Virgin Mary, on the third Sunday of the month of September, every year you shall see that St. Mary's feast is celebrated. A procession and a mass make the feast more memorable where people flock in colourful attires and loyally follow this tradition since 1647 AD. Have you heard of Darsans Samooham? It is an organization which plays a crucial role here. It is only during the festival season that the crowds get to admire the magnificent statue of St. Sebastian which is indeed a beauty. Fireworks along with the presence of vibrant colours adds to the charm of the lovely festival. Starting from the dazzling decorations to the fabulous feast laid down, St. Mary's Forane church shall not let you down. This church is also known as the Catholic Church of St. George, which is situated in Edathua, the Alleppey district of Kerala. You shall definitely enjoy visiting the place in the merry month of May during which celebrations are in full form as big feasts take place. It comprises Christian and non-Christian pilgrims. The church is in close proximity to the Mahatma Gandhi University's St. Aloysius College which is again taken care of by the church. Fond of agriculture? You can catch a glimpse of rice farms as well as lands filled with agricultural crops near the below sea level area. Would you like to know what lies nearby for some more sightseeing? You just cannot miss the huge shrine near Edathua. The brilliant infrastructure shall transport you back in time to the churches of Medieval Europe. A faithful follower of Jesus Christ, St. Thomas takes credit for having constructed the church in 1st century AD. Make sure you make yourself free from the 27th of April to the 7th of May as it is time for the annual fest! St. George is beautifully adorned in a shade of glittery gold. Special church prayers are uttered and some even include the Syrian dialect of Hebrew. Officially called the Arthunkal St. Andrew's Forane Church, it was originally built in the 16th century by the Portuguese missionaries. Imagine a church which could cure you of physical ailments. Wouldn't it be great to seek blessings from such a place and be free of diseases? A church possessing such powers is St. Andrew's Basilica. The church flaunts the statue of St. Sebastian which had blood dripping from it as it was poked by arrows from all sides. It was beautifully carved in Milan and occupies a place behind the altar, in the right wing of the church. You shall be able to visit this church if you travel for about 22 km from Alleppey. It is located in the Arthunkal village and has been uplifted to the position of the first Basilica in Alleppey, from the year 2010 while it is only ranked 7th in Kerala. The main attraction is the celebration of the ten-day festival of Arthukunal Perunnal. Devotees from all over the world trickle in to participate in this unique festival which imbibes certain traditions like crawling on your knees from the beach to the church on the last day of the festival. Beginning in early January, the festival demands a procession gathering everybody on the beach and it is a pleasure to be a part of it. Getting there is possible by both rail and air. The nearest railway station is the Alappuzha railway station (around 21 km) and Cochin International Airport is around 68 km. Do you know that this temple is lovingly known as the 'Guruvayoor' of the South and is one of the most favourite temples of the people of Kerala? This temple pays a tribute to Lord Krishna and comprises an idol of Krishna which was carried from Changanassery in 1614 AD and this event was celebrated in style. How? This is where the Champakulam Boat Race comes into the picture. The devotees consider themselves lucky to be the recipient of the Pal Payasam which is offered to the Lord and then distribute it among themselves. You need not pay a single penny to step inside the temple and hence can breathe the soothing air of the place for free. The inner arena is pretty charming with portraits of Sri Krishna and the several incarnations of Lord Vishnu. It is located in Ambalappuzha which is around 14 km from Alappuzha. Have you heard of a 'Mizhavu?' It is a musical instrument which produces sweet music at the entrance of the temple. A charming little pond shall also keep you occupied if you are interested in feeding colourful little fish. This is a temple dedicated to the snake community. You bow your head before the serpent God or Nagaraja. It is surrounded by deep jungles just like any other snake-devoted temple. You will be surprised at the number of snake paintings covering the interiors of the temple. Women with fertility issues come here to pray for the gift of an offspring and once their wish is fulfilled, a ceremony takes place complimenting the powerful Nagaraja. It is highlighted as a pilgrimage centre and it shall enlighten you to know that Nagaraja, on being highly pleased, had listened to the pleas of Parasurama and transformed the dead soil into a lively and green patch of healthy land. Houseboats and its lovely weather are a pride of this place which becomes a lively sight after monsoons and ideally should be visited between November and March. Are you a staunch follower of the deity, Sree Bhadarakali? Then this is the perfect temple for you. The Goddess is offered prayers as Maha Saraswati, Maha Lakshmi as well as Maha Kali or Durga. The temple is around 1200 years old. Maa Bhadarakali is shown extreme respect on the first day of every month by lighting a lamp with 1001 lights with special poojas conducted on Tuesdays and Fridays. Kumbha Bharani: Shivaratri marks the beginning of preparations for this festival. It occurs in the month of February or March and is deemed significant. Ethirelpu Ulsavam: You shall simply clap your hands to the tunes of classical arts performed in the evening. It occurs for 13 days and the Kumbha Bharani festival follows thereafter. Aswathy Ulsavam: The five-month festival finally comes to an end by the celebration of this festival. The deity abandons the temple to go and embrace her mother and related rituals are performed afterwards. How to get there: You can always rely on local rickshaws, taxis and buses to reach Chettikulangara Devi Temple which is situated in Mavellikkara, Alappuzha.